Let’s discuss the life-span of your roof in Miami. Your roof is often exposed to sun, rain, and wind that causes damage over time. While a traditional asphalt roof has an estimated life expectancy of roughly 12 to 20 years without a full replacement, South Florida’s hurricane seasons and harsh sun exposure can cause significant damage to your roof that leads to roof leaks. To shield your roof, manufacturers created a roof coating to attach to the roof’s surface. But what is a roof coating and how does it benefit your South Florida roof? A roof coating is an important sealant material used to protect your home against the unpredictable Miami climate and extreme weather conditions. When a roof coating is applied to a roof’s surface – it absorbs the bulk of the damage. Not all roof coatings are created the same, and there are many variations in material and durability that affect the degree to which a coating protects your roof in South Florida. Silicone – Compared to other roof coatings, silicone provides great durability and weatherproofing. This roof coating, along with Polyurethane, can withstand ponding better than other types of coatings. It is sold as a full roof coating that often does not require a primer. However, it loses its UV rating faster than most other types of roof coatings. Bitumen – An asphalt-based coating used around flashing, skylights and chimneys on asphalt roofs. This roof coating is typically not used as a complete roof coating. Polyurethane – A new roof coating that requires a primer and two coats. It has the best insulating properties of all roof coatings. It is also the most durable and is often used for high-traffic areas. This roof coating, along with Silicone, can withstand ponding better than other types of coatings. Acrylic – The cheapest and most common elastomeric roof coating. This roof coating is used for short-term sealing because it lasts less than 10 years. EPDM – This roof coating is thicker and expensive, but only requires a single coat. 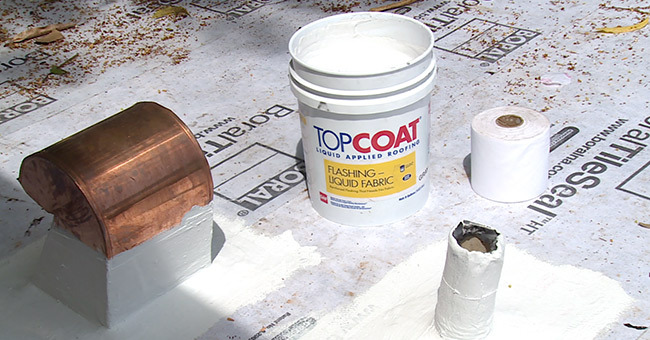 This roof coating is used on almost any roofing type with the right primer. Roof coatings have more than one purpose – there are many benefits roof coatings offer to your Miami home. Many roof coatings promise waterproofing which even claim a year-round ability to withstand ponding water. This helps extend a roof’s life by several years or more. Sun light can be tough on your roof – especially for dark colored roof surfaces. Ultraviolet rays cause molecular changes in most roofing materials that leads to deterioration. 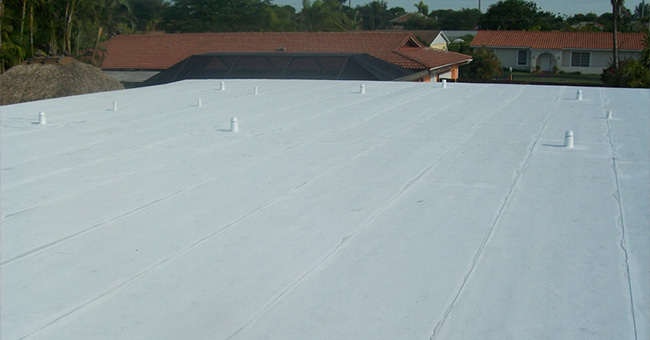 Sealing a roof in white color helps reflect sun exposure, reducing cooling costs by reducing indoor air temperature. Some roof coatings can also act as fire-retardants for your roof. A roof coating can extend a roof’s life. By sealing a battered roof due to harsh climates, you can extend the life of your roof by more than 10 years depending on the coating used. Before sealing your roof, it must be inspected for damage. A coating should not be applied to a roof that is extremely damaged. In some cases, an inspection will identify any areas in need of a repair before a coating can be applied. Occasionally, it will also shed light that the roof must be replaced. Generally, professional roof sealing in South Florida may cost anywhere between $1 to $5 per square foot. The price depends on the size of the roof, the type of roof coating used and your location. Large roofs are usually less expensive per square foot then small roofs, and thicker roof coatings with light-reflecting qualities usually cost more. Selecting a roof sealing is an important decision that can have a significant impact on the longevity of your roof. Be sure to consult a roofing professional who understands roof coatings, ensuring they can pick out a quality product that reflects your roof type and protects your home. Our trained staff at T&S Roofing Systems is especially equipped to help you select the right material and properly seal your roof in Miami.